Three Drives, Richard Durand feat Hadley, Kyau & Albert, Kernkraft 400, System F vs. Cosmic Gate and more. This is the 3rd edition in the &apos;SAtrancefamily Special Guest Set&apos; series. 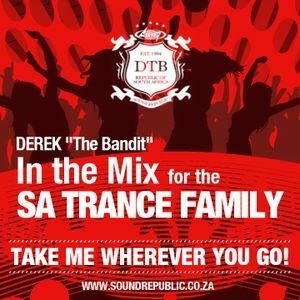 Derek The Bandit (DTB) pioneered the South African dance music scene starting in the early 90&apos;s - Over the last 22yrs he&apos;s presented the biggest EDM radio show on the flagship National Radio Station (5FM) called &apos;The World of Dance&apos;, released various successful dance compilation albums and headlined some of the biggest dance events in the country. As always- you never disappoint.